The Fall 2017 Career Fair is on Wednesday, September 27th from 11:00am-4:00pm at the Iowa Memorial Union (IMU) Main Lounge. A few other fairs and networking events are also happening that week! The University of Iowa provides some awesome opportunities to help us make connections and prepare ourselves for our careers. The Pomerantz Career Center is located on floor three of the Pomerantz Center (white building by the brain rock). They offer a number of free services to students geared toward professional development. 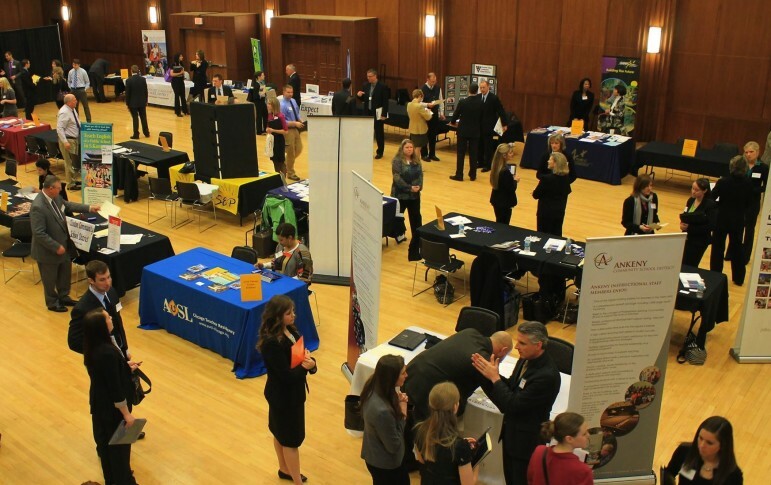 One event they coordinate both during the Fall and the Spring is the Job & Internship Fair (AKA the Career Fair). This is an event where employers interested in employing Iowa students come to meet with students about potentially working with their companies. The Fall 2016 Career Fair will take place on Thursday, September 22nd 2016 from 11am-4pm in the Main Lounge and Second Floor Ballroom of the IMU. Here are some Do’s and Don’ts for prepping for the fair! Download the career fair app (available for iOS and Android) by searching ‘U of I Career Fair Plus’. Here you will be able to see a map of the fair, keep up to date on announcements, see a full list of employers attending, and more. Practice a comfortable, firm handshake with a friend and a professional, confident introduction of yourself. These are two skills that can be easily lost with our generation’s tendency to communicate only digitally. Make sure you look the employers in the eyes and have a warm smile! Practice your “elevator speech” or the 30 second introduction you will give employers when you meet them. Consider what you hope to gain from the Fall Career Fair. Do you just hope to gain more experience and ease in talking professionally with potential employers? Are you interested in job shadowing with this company to explore a potential career path as an undecided major? (This is how I decided on my major, and I whole-heartedly encourage it!) Do you want to do a summer internship with the company? Dress non-professionally! Essentially, dress modestly and in a way that doesn’t cause a distraction from conversation. For a more full-length summary on what “professionally” means for this event, click here! Get discouraged or overwhelmed! Adulting can be scary but there are a lot of resources to help! I like to think that all experience is good experience! The worst that can happen from trying is that you will become even more comfortable and prepared for attending the Spring Career Fair! If you are unable to attend this event, no worries! The Pomerantz Career center is still a resource open to you for developing professional skills. In addition, you may want to utilize hireahawk.com, the University of Iowa’s website for job postings where employers are either seeking current UI students or alumni.